This article explains digital signatures (also known as digital ID), what they can be used for, and how you can use digital signatures in the following Microsoft Office programs: Word, Excel, and PowerPoint. A digital signature is an electronic, encrypted, stamp of authentication on digital information such as e-mail messages, macros, or electronic documents. A signature confirms that the information originated from the signer and has not been altered. Signing certificate To create a digital signature, you have to have a signing certificate, which proves identity. When you send a digitally-signed macro or document, you also send your certificate and public key. Certificates are issued by a certification authority, and like a driver’s license, can be revoked. A certificate is usually valid for a year, after which, the signer must renew, or get a new, a signing certificate to establish identity. Tip: For more information on obtaining a digital certificate see Obtain a digital certificate and create a digital signature. What does a digital signature guarantee? Notarization Signatures in Word, Excel, or PowerPoint files, which are time stamped by a secure time-stamp server, under certain circumstances, have the validity of a notarization. Important: Signed documents, which have a valid time stamp, are considered to have valid signatures, regardless of the age, or revocation status, of the signing certificate. When the signer adds a visible representation of a signature to the document, a digital signature is added at the same time to authenticate the signer's identity. Important: A digitally-signed document becomes read-only to prevent modifications. In the document or worksheet, place your pointer where you want to create a signature line. On the Insert tab, in the Text group, click the Signature Line list, and then click Microsoft Office Signature Line. Suggested signer The signer's full name. Suggested signer's title The signer's title, if any. Suggested signer's e-mail address The signer's e-mail address, if needed. Instructions to the signer Add instructions for the signer, such as "Before signing the document, verify that the content is correct." 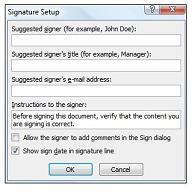 Allow the signer to add comments in the Sign dialog box Allow the signer to type a purpose for signing. Show sign date in signature line The date the document was signed will appear with the signature. Tip: To add additional signature lines, repeat these steps. Note: If the document remains unsigned, the Signatures Message Bar appears. Click View Signatures to complete the signature process. When you sign a signature line, you add a visible representation of your signature and a digital signature. In the file, right-click the signature line. Note: If the file opens in Protected View, click Edit Anyway, if the file is from a reliable source. From the menu, select Sign. To add a printed version of your signature, type your name in the box next to the X. To select an image of your written signature, click Select Image. In the Select Signature Image dialog box, find the location of your signature image file, select the file that you want, and then click Select. For customers using Chinese- (Traditional or Simplified), Korean-, or Japanese-language versions, the Stamp Signature Line option appears. In addition, you can sign a signature line by double-clicking the signature line. Type your name next to the X. Or, in the Signature Pane, in the Requested Signatures section, click the arrow next to the signature. From the menu, select Sign. To add a handwritten signature (Tablet PC users only), sign your name in the box next to the X by using the inking feature. The Signatures button appears at the bottom of the document or worksheet. The following image shows the Signatures button. Open the document or worksheet that contains the visible signature you want to remove. Note: In addition, you can remove a signature by clicking the arrow next to the signature in the Signature Pane. Click Remove Signature. An invisible digital signature, such as a visible digital signature line, assures the authenticity, integrity, and origin of a document. You can add invisible digital signatures to Word documents, Excel workbooks, and PowerPoint presentations. Signed documents will have the Signatures button at the bottom of the document. In addition, for signed documents, signature information appears in the Info section that you see after you click the File tab. To protect the authenticity of a document's content, you can add an invisible digital signature. Signed documents have the Signatures button at the bottom of the document. 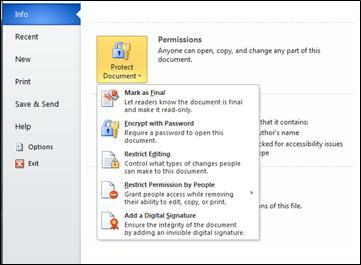 Click Protect Document, Protect Workbook or Protect Presentation. Click Add a Digital Signature. Read the Word, Excel, or PowerPoint message, and then click OK. In the Sign dialog box, in the Purpose for signing this document box, type the purpose. After a file is digitally signed, the Signatures button appears, and the file becomes read-only to prevent modifications. Open the document, worksheet, or presentation that contains the invisible signature you want to remove. The document, worksheet, or presentation view returns, and the Signatures pane appears. Next to the signature name, click the arrow.